Before delving into the Reinad “issue,” I must pay homage to the two of the finest jewelry collectors and historians of costume jewelry we know: Roberto and the late Carla Brunialti. Their love of beauty and dedication to research is unparalleled. My brooch marked with Chanel Novelty Co./Reinad script signature brilliantly revealed in Roberto and Carla Brunialti’s “A Tribute to America” published in 2002. Chanel Novelty Co. had one collection in 1941, which makes the jewelry “rare.” However, in my personal opinion, at least with this piece, it basically consists of low quality pot metal and cold painted enamel. No wonder the House of Chanel made Chanel Novelty change their name back to Reinad, since the quality is nothing compared to authentic Chanel jewelry. CLICK ON PHOTO FOR LARGER VIEW. They came to the United States and went to Washington, D.C. to painstakingly research every single jewelry patent long before they were available online, and they scoured the archives at Women’s Wear Daily for even more clues. After Carla’s death, Roberto continued to add and improve on the research that was previously done in their two books American Costume Jewelry and Tribute to America. Because the Brunialti’s are so admired, and their research so scholarly, naturally many of us refer to their books as our bibles. One thing students of jewelry do, whether casually or as serious collectors or historians, is take all of the wonderful work that has come before and, hopefully, build upon that base. With all the tremendous resources now available online and in other archives, we have the ability to do that. So I say all of this with my deepest respect and admiration for what has come before: not as much was known then as we know now. Because so many of us continue to do research and question or to reaffirm what we’ve read, I’ve had to question whether similar pieces done by Eisenberg, DeRosa, Hattie Carnegie, Boucher and others also found marked Reinad are “proof” that Reinad “worked” for these companies producing goods for them, as the Brunialti’s originally stated. In truth, I believe many of those Reinad pieces are period copies of other manufacturer’s designs. Through interviews with Ruth Kamke of Fallon & Kappel who produced some of the most beautiful designs by Eisenberg and early Hattie Carnegie, an interview with Sandra Boucher regarding Marcel Boucher and the bane of style piracy, and my own research poring over newspaper articles featuring Carl Fishel of Trifari shortly before they won their landmark case against Charel in 1955, I’ve come to understand how period copies were made. Another example of a beautiful DeRosa brooch copied by Reinad. Although the Reinad piece is pretty, there is no comparison to the gorgeous enamel on the DeRosa version. Both this DeRosa brooch owned by Jane Clarke and the Reinad copy owned by Bobye Syverson can be seen on Morninggloryjewelry.com. Jane also owns many of the beautiful guoache drawings that correspond to the DeRosa jewels. CLICK ON PHOTO FOR LARGER VIEW. All one had to do was buy a piece of jewelry at retail, remove the stones, make a cheap cast, and presto … they could churn out copies overnight. It was a simple process. It was profitable. And it was done repeatedly in the 1930s and beyond by many different companies (some whose names we will never know). The problem is the copies are always made more cheaply. And not only that, there were even cheaper copies made of the original copies! Examining the originals side by side with Reinad’s period copies serves to prove that they weren’t working with Eisenberg, Hattie Carnegie, De Rosa and others. They were pirating their designs. As a perfect example, take the Hattie Carnegie Asian Princess original which was also remade by Reinad. If you look at them quickly side by side, they look very much alike, but the original was made by Fallon & Kappel. Not only did F&K produce many of the exquisite early Hattie Carnegie pieces (marked HC in a diamond) designed by the renowned Ruth Kamke, but F&K used a characteristic pin clip (also known as a fur clip) with two holes in it. There are many pin clip designs, but this particular two-hole clip used by F&K is very specific. If you look at some of the most beautiful early HC pin clip designs, or some of the best Eisenberg pin clip designs, they will most surely bear that characteristic type of clip. Although F&K used a few other different pin clip mechanisms on their designs over the years, I have never known anyone OTHER than Fallon & Kappel to use the two-hole pin clip mechanism. Several of my signed authentic Eisenberg pieces made by Fallon & Kappel use this finding as does one of my Hattie Carnegie signed bow clips. Most all of their goods are also stamped with a circle that is part of the mold, and a stone setter’s letter or number that corresponds to the person who worked on the piece. The original Fallon & Kappel Hattie Carnegie piece is a work of art. It is made in two separate castings, one for the head and one for the ruffled collar which are then held together with screws. There is a straight bar in the back not only to join the castings for extra security, but also for balance so it will lay beautifully on the garment without falling over from being top heavy. There is a beautiful jeweled necklace with tiny clear rhinestone bezel set and a large round prong set pendant. All of the stones are set into drilled in settings like fine jewelry (not glued) and all of the navette (marquise shaped) stones surrounding the ruffled collar are prong set. All of this was tedious, laborious, hand done, expensive work. The Reinad Asian Princess, on the other hand, can be found both as a pin clip, with a standard pin clip from a finding house used on many signed and unsigned pieces of jewelry, and an even cheaper brooch. The stones are all glued in, with the navette stones glued into faux pronged settings. The two pieces are not screwed together, but made in one piece, not in two separate castings. On top of that, there are even cheaper versions than those made by Reinad, likely made another company, that sold for $1.07 in a 1943 Sears catalogue ad. Ruth Kamke said she never heard of Reinad or Staret (another company based out of Chicago), two companies that made jewelry very similar to the Fallon & Kappel jewelry that have led the Brunialti’s to purport that Reinad produced pieces for many different high-end companies. In turn, other historians and writers/dealers, and eBay and internet sellers have repeated this assessment over and over again, and by repeating it ad infinitum, has now become “fokelore” and believed to be true. Reinad Novelty was a metal house that was, along with 49 other companies, incorporated in 1930. They had various addresses listed in New York through the 1930s, but the company name was ALWAYS Reinad Novelty. Chanel seems to be the name they “took” for one season in 1941. They had to REVERT back to Reinad Novelty due to pressure from the House of Chanel in France. In a WWD ad from February 28, 1941 it shows them at 28 W. 38th Street (where Chanel Novelty was formerly located before the name changed back), and also with a showroom at 347 Fifth Avenue. Thankfully, the Brunialti books rectified this error in print, which was groundbreaking research. I can also say with authority that a few years ago on eBay a brooch was discovered both marked Reinad and Chanel in script, no doubt made during the changeover in marks. These double struck anomalies can be found by other companies such as when Déja changed its name to Réja, and when KTF changed their jewelry to the TRIFARI mark … both names of the companies are marked on a single jewel. The Brunialti books mention that the Chanel script signed pieces to be of excellent quality. I own one of the “hand painted enamels with either colored stones or satinore” signed Chanel in script and find mine to be a fairly uninteresting pot metal pieces of “okay” quality, but then there are others that are much more beautifully made. What made these pieces so collectible and sell for such a fortune was the incorrect assessment that this was “Coco Chanel’s” jewelry from France. In the book Jewelry by Chanel written by Patrick Mauries in 1993, there are several script signed “Chanel” costume pieces that we now know are Chanel Novelty/Reinad. Most of them in the book are incorrectly dated 1925-1938 and attributed to Fulco di Verdura, the jeweler who designed Chanel’s iconic and very famous Maltese cross bracelets. On pages 92 and 93 there are three particular brooches of note that disprove this theory. Verdura WAS in Paris from 1925-1934, but that fall he sailed to the United States and was introduced to famous jeweler to the stars Paul Flato by Diana Vreeland, editor of Vogue Magazine. Verdura began working for Flato in Hollywood at that time. There are documented patents under Verdura’s name with Paul Flato as the assignor, as well as the Flato ad for one of these particular brooches in 1938. On September 1, 1939, the day war was announced in Europe, Fulco di Verdura opened his own salon at 712 Fifth Avenue in New York City backed by Cole Porter and Vincent Astor, according to Verdura.com. Last year I was lucky enough to attend a private showing at the VERDURA exhibit at their offices and showroom on Fifth Avenue in New York City. Not only did I get to see Chanel’s original bracelets crafted of precious metals and gemstones designed by him, but there is only one recorded interview of his voice made during his lifetime, and the woman that interviewed him in the 1950s asked him about faux jewels and he clearly said, “I DO NOT MAKE COSTUME JEWELRY.” He never had anything to do with Chanel costume jewelry except for designing her incredible Maltese Cross bracelets that were made out of Sterling/Gold/and her genuine gems that he re-set for her. It is Chanel herself that had her couture house copy his fine jewelry designs into faux, and they have continued for years including versions by Robert Goosens for Chanel, and still made today in the zillions under the Kenneth Jay Lane brand. Even Joan Rivers copied these bracelets for her QVC line. I’ve seen some marked Ciner, too. In case you did not know, David Mir was a freelance designer who in 1941-1942 also designed some of the most gorgeous and highly coveted designs for Trifari, including a beautiful 5” enamel and pearl belly swan as well as their rare and incredibly huge jelly belly eagle. The shape of the seahorse’s face, fins, and the seaweed are almost exact copies. More cheaply made, of course, and if you saw them side by side, you would know immediately which one was the Chanel Script/Reinad copy. The well-known Chanel Novelty frog is also an obvious lower quality pot metal and cold enamel copy of Marcel Boucher’s magnificent metallic enamel frog set with glass cabochons done around 1941. If Reinad would so blatantly abscond with the Chanel name, what would keep them from pirating designs by other companies, especially most of them that were not patented and therefore NOT protected? Reinad also did a copy of the Marcel Boucher gryphon brooch in rhinestones that I mentioned at the beginning of my article “The Piece of Your Dreams … Or Is It?” This is patent number D129843 dated October 7, 1941 by Boucher. Well, to me as a researcher, this should indicate there wasn’t a huge amount of Reinad jewelry manufactured. But even searching the Internet today, I find many MANY signed pieces of Reinad jewelry (and not only brooches). Most companies from this era, namely the late 1930s and ‘40s, have their own particular style, however, Reinad does not. Based on my research, this seems to be due to the bulk of their business consisting of copying other jewelers unpatented and UNPROTECTED designs. And the list goes on and on. Unfortunately, because there is so little paperwork left by Reinad, and very few advertisements, it’s impossible to say precisely when this jewelry was made in relation to the originals. If they did the designs a year or two after the originals, I would think there would be less chance for lawsuits. Or, if they copied from smaller companies, such as DuJay, Boucher, DeRosa and Leo Glass, the original companies most likely could not afford to sue. Boucher once sued Coro and won, but it cost him $50,000 in legal fees. That’s a sum that a smaller manufacturer just could not afford to spend on a constant basis. While there isn’t much of a Reinad paper trail available to document the company’s work, in 1940-1941 several patents did appear under the name of Harry Reinstein. These include a couple of cannetille style metal necklace and bracelets and in 1941 a set of jeweled alphabet pins (DuJay patented a set of enamel floral alphabet pins in 1940, and in 1941 Marcel Boucher patented an alphabet pin as well, very similar to the Reinad ones). I found one of the cannetille style bracelets in Amazing Gems by Deanna Farnetti Cera (1997) with the name Chanel in script. She even questioned the cursive mark at the time her book was written. This bracelet is the ONLY real “Chanel” looking piece I’ve ever seen. The gold plating is beautiful, and it is decorated with red, green, blue and round balls. Another Chanel script signed necklace in cannetille style I’ve seen had a silvery-type cheap plating and a patent by Harry Reinstein in 1940 appears with the same link but for a bracelet. In 1941, Adolph Better also had three patents assigned to Reinad for a costume jewelry chain and a chain ornament. Refer to utility patents US2244637, US 2259059, and US2248802. In 1948 and 1949 a few more patents appear by Harry Reinstein. In 1949, a patent for an earring by William Wienner (D155326) as assignor to Reinad Novelty Company, and finally, also in 1949, a patent by Harry Reinstein for Reinad Novelty for “Flexible Fabric Composed of Rigid Interconnected Links” (like the Van Cleef Ludo Hexagon design) appears. Patent US2460654A dated 1949, finally linked to the name Reinad. None of the other patents issued in his name ever mentioned the business name. In 1949, Harry Reinstein’s patent D154954 for a Victorian looking slide bracelet finally appears in one of the few Reinad ads that I’ve found. In “The Bee,” a newspaper from Danville, Va. the bracelet appears, and although it’s not the exact picture from the patent, I’ve seen several versions of it. The ad states “Reinad’s copy of a $200 piece in gold-colored metal and filigree,” confirming proudly their copying of more expensive pieces. It sold for $2.98 in 1949 (approx. $27 today, so it was never expensive jewelry). Also in 1949, another item appears in a newspaper ad for a gold colored necklace, earrings and bracelet from $2.98 to $5.00. In 1949, a Reinad necklace appears in a Camel Cigarette ad with “Jewels by Reinad” (the necklace patented in 1948 by Harry Reinstein D151338). Another ad showed a cheap pair of bell earrings in 1953 for $1.98-$2.98. And finally, the last ad I found was for a bunch of cheap necklaces from the “Indiana Evening Gazette” in 1954. That’s when all information about Reinad stops. On June 15, 1956 Harry Reinstein died and several obituaries for him were published in the New York times, one by Peltan & Lerd Corp. (issued by the company) but then there is another one mentioning them as Peltan & Kern (agents for jewelry factories) that he was working for at the time of his death, and how his loss would be felt by the entire jewelry industry. Obviously one of the names is an error but I find no record for either company except for Harry Reinstein’s obituaries. What I find very odd is usually obituaries are a wealth of information, a history of the deceased, especially for a person that was so important and beloved in the jewelry industry. There is absolutely no mention in any of the obits of Reinad. Why? For a company that was supposedly as prolific as Reinad, who was said to have “worked for Hattie Carnegie, Boucher, Mazer, etc.,” very little about this company is known. Some of their jewelry was very beautiful, and of lovely quality, but much of it lower end and mundane. Their copies of the Hattie Carnegie Asian Princess and Hattie Carnegie Unicorn are beautiful, but again, in no way compare to the Fallon & Kappel originals. Even their Sceptron jewelry consists of only a few styles, and I have found a Sceptron bracelet (with their bow) on a bracelet marked Dorson’s, who must have provided them with the chain or made it for them. Why would a taskmaster, a genius, brilliant jeweler/designer/modelmaker and perfectionist such as Marcel Boucher allow this company to make his patented Gryphon brooch in a cheaper version? In the Vintage Fashion & Costume Jewelry magazine Volume 2, No. 2 of Spring 1992, there is an article on Marcel & Sandra Boucher. “Although Boucher had a successful business located at E. 23rd Street in New York City, Sandra and Marcel Boucher were the designers. It is interesting to note that Boucher NEVER farmed out his work. 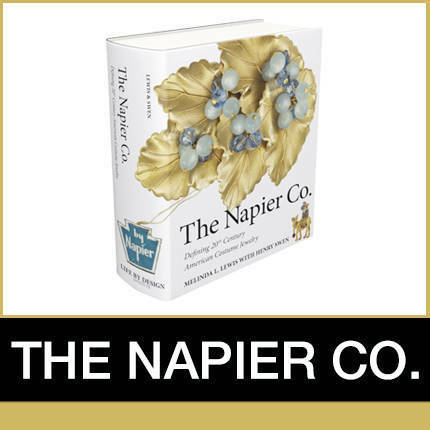 It was started AND finished in HIS OWN FACTORY.” I think this makes it abundantly clear that Marcel Boucher never had anyone produce jewelry for him in New York (his jewelry in Canada was produced by Abe Mazer who owned the Avon of Belleville factory). Why would the Mazers, whose jewelry is so exquisite and so high end, allow one of their beautifully rhodium plated pavé set face pin clips to be made in pot metal by another company? And lastly, would the DeRosa’s, a family owned business, makers of some of the most beautiful costume jewelry of the highest caliber, have Reinad make a version of their gorgeous swan they did so beautifully, or a version of a brooch that they advertised themselves? So many drawings of their jewelry exist. Why would they need Reinad to make anything for them that they made so beautifully themselves? This leads me to believe that the previous assumptions made about Reinad were erroneous. I believe my research shows that Reinad, at its best, was one of the most egregious copiers of the designs of others. This company’s jewelry is collectible and much of it beautifully made, which should have been enough on its own.